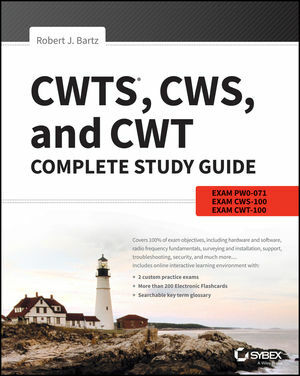 CWTS Certified Wireless Technology Specialist Study Guide is your number-one resource for comprehensive exam preparation. Updated to study in 2017 and beyond, this book takes a multi-modal approach to ensure your complete confidence and ability for the big day: full coverage of all CWTS exam objectives reinforces your conceptual knowledge, hands-on exercises help hone your practical skills, and the Sybex online learning environment provides flashcards, a glossary, and review questions to help you test your understanding along the way. An objective map and pre-assessment test allow for more efficient preparation by showing you what you already know and what you need to review—and the companion website's complete practice exams give you a "dry run" so you can pinpoint weak areas while there's still time to improve. If you're serious about earning your CWTS certification, this book is your ideal companion for complete and thorough preparation. Learn critical concepts and apply essential skills in areas like hardware and software, radio frequency fundamentals, surveying and installation, support, troubleshooting, security, and more. This guide gives you everything you need to approach the exam with confidence. The CWTS certification gets your foot in the door of a growing industry, and is a stepping stone to the industry standard CWNP certification. The exam will test your abilities in all fundamental areas of Wi-Fi technology, so it's important that your study plan be complete and up-to-date. CWTS Certified Wireless Technology Specialist Study Guide is your ideal solution for comprehensive preparation. Robert J. Bartz, CWNE, CWNT, is a technical trainer and consultant with more than 26 years of experience in computer networking technology. He has been involved with the CWNP program since its inception, and has taught vendor-neutral IEEE 802.11 wireless LAN technology to thousands of people globally. Robert is also the author of the first two editions of CWTS: Certified Wireless Technology Specialist Official Study Guide.